My immediate reaction was, Zowee! I assumed this was an artist's rendition of a bank that never was. Then I learned it was. And better yet, it still is! This past February we loaded up the Volvo and headed down the turnpike. 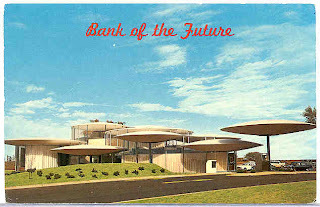 Today it's an Arvest Bank and you'll find it in Oklahoma City just north of the capitol complex on Lincoln. The building has experienced some blandishment through the years, but it's still definitely futuristic. The layout of the structure is a diamond shape– but you'd never know it from the outside. The drive-thru has been extensively modified from the original vision of the future. Originally the tellers each had their own little "pod" to work from, this was a trend at early autobanks, but now they are seated together in the main building. The overall condition of the building is excellent. I have to admit I was expecting some crumbling concrete and exposed rebar rusting in the sunlight. It's actually in very good condition inside and out (we couldn't "officially" snap photos inside because the place is still a bank). One feature that has not been altered is a novel circular elevator taht measures about 15 feet in diameter. It's like a lounge and elevator all rolled into one! The best part is it's still functional– notice how Jackie is lounging in circular comfort as she descends several feet! Downstairs is the vault, safe deposit boxes and meeting rooms. A hallway on the drive-thru end appears to be (and I am guessing here) the original access route to the teller stations. I wonder if the original job application asked about claustrophobia? All in all a true delight, and well worth the detour. Bailey, Bozalis, Dickinson and Roloff is the architectural firm (same as the Gold Dome). Built about 1964.